You’re playing a sit and go tournament, seated in the big blind. The blinds are 25/50 and there are two players who have limped in. You have 78off suit and the flop comes Q87 with two clubs. Your stack is 2,000 and the other stacks are 3,000 and 4,000. 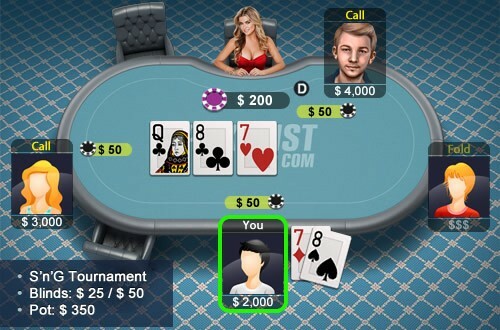 The small blind has also folded pre-flop, so, the two players have limped in for the 50 chips.